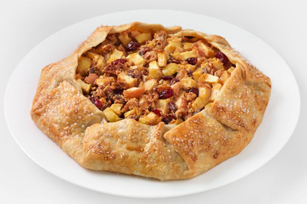 We turned up the flavour in this fall favourite - apple pie gets a tart twist from dried cranberries! Our Cran-Apple Pie tastes even better with a dollop of whipped topping or a scoop of vanilla ice cream - yum! Unroll pie crust onto parchment-covered baking sheet; roll to 12-inch circle. Mix dry pudding mix and cinnamon in large bowl. Add fruit, nuts and 2 Tbsp. water; toss to evenly coat. Spoon onto centre of crust; fold edge of pastry over fruit mixture. (Fruit in centre will remain uncovered.) Beat egg and remaining water with fork until blended; brush onto crust. (Discard any remaining egg wash.) Sprinkle crust with sugar. Bake 30 to 35 min. or until fruit is tender and crust is golden brown. Cool completely. Apples that are good for both cooking and eating raw are called all-purpose apples. Varieties include Braeburn, Cortland, Empire, Granny Smith, Honeycrisp, Jonagold, Jonathan, McIntosh, Northern Spy, and Winesap. Save 70 calories and 3g of total fat per serving by preparing with 1 pkg. (4-serving size) Jell-O Vanilla Fat Free Instant Pudding, and reducing cranberries and pecans to 1/4 cup each. Serve topped with thawed Cool Whip Whipped Topping or vanilla ice cream. Check dessert after 25 min. If the crust is becoming too brown, cover the edge loosely with foil for the remainder of the baking time.